Kwikspace is a manufacturer of temporary and permanent prefabricated accommodation for use across numerous industries. Also known by the generic name, park homes, modular accommodation – or prefab accommodation – from Kwikspace is ideal for numerous industry and domestic applications. Multiple layouts like single or shared accommodation, residential houses and dormitory style facilities are offered with these mobile homes, all of them as comfortable as traditional buildings. They are the ideal away-from-home homes and can be implemented as temporary or permanent structures for accommodation with the option to rent or buy. Modular prefab buildings and prefabricated accommodation are ideal for staff accommodation in the mining and construction industries where employees are required to live close to site or even on site. They also make idyllic homes, living quarters, storage facilities or temporary shelters on agricultural holdings, in rural areas and in holiday camps, for example. Additionally, there is no difference when manufacturing mobile accommodation units or modular prefabricated site offices, meaning Kwikspace provides to your requirements at any given time. All accommodation solutions from Kwikspace can be supplied fully fitted and furnished, providing cupboards, furnishings, appliances, beds, tables, lamps, etc., as well as luxury and safety comforts like air conditioners and security bars and gates. These solutions are also often used as a container office or mobile office on any site and include single or multiple ablutions. As a supplier of prefabricated accommodation solutions, Kwikspace’s range is not limited to the delivery of single or multiple accommodation units only! The company has the experience, expertise and technology to deliver single- and double-story configurations for temporary or permanent use. Modular buildings used for accommodation purposes are a cost-effective, flexible way to provide living space for onsite personnel. 3 or 3.5 m wide units available in 6, 9, 12, 15 or 18 m lengths. Versatile, plug-and-play accommodation, from single rooms to dormitories and site accommodation. 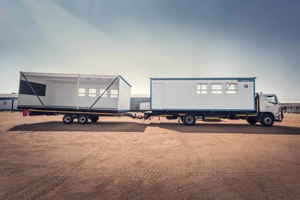 Ideal as site living quarters, these mobile units are joined on-site and connected to create buildings 7 m wide with 6, 9, 12, 15 or 18 m lengths. 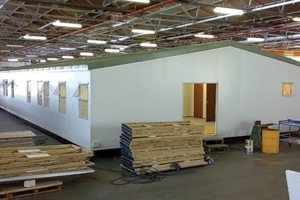 For those larger accommodation requirements, these buildings are fabricated in modules, so we can supply range of sizes for ALL types of accommodation requirements. Kwikspace has over 50 years’ experience in supplying accommodation to industry. 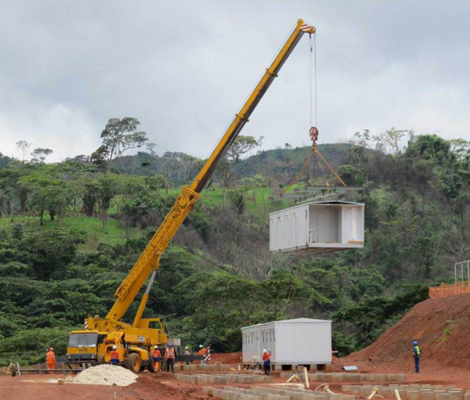 Prefabricated site accommodation for construction sites, building sites and construction camps throughout Africa. Prefabricated modular construction accommodation units to rent or purchase for any construction site. Rental accommodation units are returned on project completion. Purchased accommodation structures can be demounted and relocated to the next construction camp. Temporary or permanent school hostels provide accommodation for boarders. Our rented and purchased mobile accommodation units can be installed in multiple layouts, from small houses to large hostels, making the ideal mine camp and remote camp. Our solutions for all container hire and purchase include furniture fittings and equipment as required for any mobile camp. Kwikspace modular buildings can be used to house school boarders living at the school week-to-week, month-to-month or term-to-term. Kwikspace also provides prefabricated mobile kitchens and dining quarters that can be used at boarding schools.. 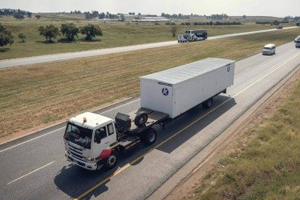 Mobile clinics and hospitals must have space to accommodate patients. Kwikspace can easily and quickly add any number of wards to accommodate patients who need in-hospital care. Mining and construction site houses or residential houses. Factory built mobile homes (relocatable park homes) can be added to a home-owners property or can be used for township temporary or permanent housing. They can be supplied fully fitted and furnished, and rental accommodation can be relocated after the rental period. What makes Kwikspace’s rental buildings superior?? The Kwikspace insulated panel is coated in 0.5 mm Aluzinc painted steel, providing improved corrosion resistance and increased durability and longevity of your prefabricated buildings. Need onsite / off-site accommodation quickly? 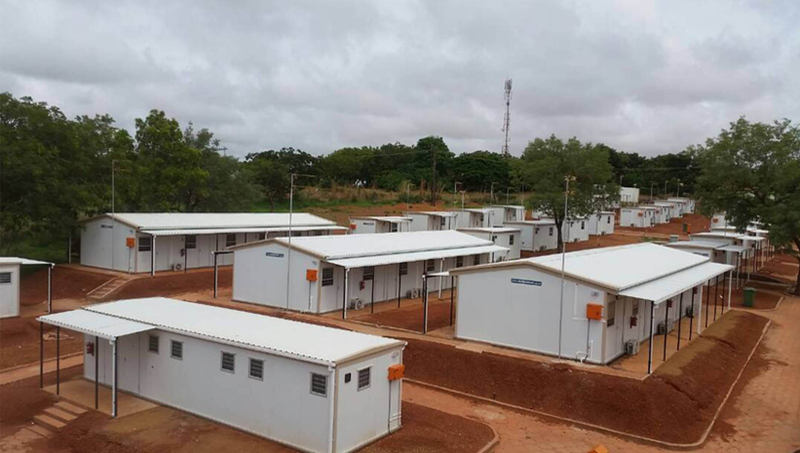 Kwikspace has the largest modular building rental fleet in sub-Saharan Africa and permanent modular buildings are manufactured daily in our ISO 9001:2008 factory! We can deliver rented accommodation in 10 working days or less. Accommodation for purchase take only a little longer – delivered to site in up to 4 weeks. Why use Kwikspace – specialists in accommodation for the construction and mining industries? Speak to us about your accommodation requirements!